Looked at a new 2019 Sierra at the dealer yesterday after a light rain and the back passenger seat was covered in water and the top of the rear window was dripping. Not a good sign. Only a fluid change? Whats the likelyhood of this actually being the real permanent fix? I am on my third tc and my truck is shuttering again. Starting to feel like a normal maintenance item, replace the torque converter and flush every third oil change. Since it is still under powertrain warranty i dont want to modify it with a tune and aftermarket tc as im afraid of having an issue and my warranty being denied. As far as a fix goes gn flushes the trash out of your transmission (how much damage has been done or is being done by this) than if that does t fix it they put in a new torque converter. Each one ive had has been a different part number so apparently the updates have not resolved the issue. I believe the real issue is in the transmission tuning and trying to get mpg by sacrificing reliability. 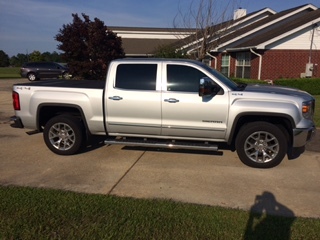 Well at 52k miles my 2015 Sierra 6.2 8sp has started to shudder again. Aleady had the torque converter replaced twice first at 16k and than at 34k, a yearly occurrence it seems. Its pretty obvious why gm dropped the 100k mile warranty. Whats the chance gm will actually come up with a fix for these transmissions or will they just abandon us that own them and hope we are dumb enough to trade into a new gm truck? Did you ever figure out the footwell ticking issue? I have had no luck finding what causes the noise however it has gotten worse with the more miles i drive. Now that im out of warranty i guess im stuck listening to it until i trade it in. I just had my torque converter replaced for shutter for the 2nd time. Both time they lasted roughly 16k miles. Does anyone have high miles on their 8sp as i am very concerned about long term reliability. I see now why they decreased the powertrain warranty. Just picked my truck up after having a new torque converter installed (for the 2nd time) and once again they claim they do not hear anything out of the ordinary. I believe they just have no clue how to fix and and dont want to throw more parts at it as my bumper to bumper warranty is about to run out. My truck has the exact same issue with the noise and it starting after hitting a bump. My dealer has replaced the exhaust clamp and the drivers side exhaust manifold with no improvement. Now the dealer mechanic claims he doesnt hear it and all the noises he hears are normal. Im going back to the dealer tomorow for transmission issues with torque converter shutter and will have them look into the noise again. I am having the same issue with my 2015. The torque converter has already been replaced once for this exact same issue. The transmission tech at the dealer told me that it the shuttering was not bad enough yet and to keep driving it until the vibration and shuttering gets worse. No diagnostic tools were connected to find out the amount of slip. They were also hesitant to work on it as it had been less than a year since the first replacement. Does gm give dealers a hard time about warranty repairs if they have a reoccurrence within a year? Obviously this would not be due to anything the dealer did or did not do but just poor parts quality or design issues. I know the gm customer service people lurk on the board how about providing contact information to someone that can give us a straight answer to the ongoing issues with these 8 speeds. Your right these nagging issues make you paranoid. The truck already had an appointment scheduled to attempt to fix the noise issue it has when this started. This will be the third time they will atempt repairs for what sounds like a cracked exhaust manifold in the cab The first repair attempt they said it was the exhaust clamp, the second they said it was a cracked exhaust manifold, and this time they are thinking it could be the check valve in the fuel line. Basically the dealer just keeps throwing parts at it with no success and perform no post repair testing. The truck gets driven pretty lightly, mostly highway miles and i havent towed more than 6k lbs with it. The username is my old username from when I drove a 5.0 mustang LX. I have the same rpm fluctuation at steady speeds but also have the random shutter that feels like im running over a rumble strip. Between 40-50 mph it randomly shutters, its even worse under load. My last failure started this around 60mph and continued to get worse the more i drove it. My 2015 6.2 sierra is going in for the 2nd time for a failed torque converter. First one failed around 16,000 miles and the second one has started showing the same symptoms at 31,000 miles. My dad has a 6.2 truck as well and his tc failed around 10,000 miles. Im getting a little concerned about having to replace the tc every third oil change and the long term costs after the warranty. Are others having the same issues out of these 8sp transmissions? My 2015 sierra 6.2 has what sounds like an exhaust leak when under load or mild acceleration. It sounds like ithe noise is coming from the bottom of the drivers door. The noise increases and decreases with rpm's. Has anyone else had this issue?